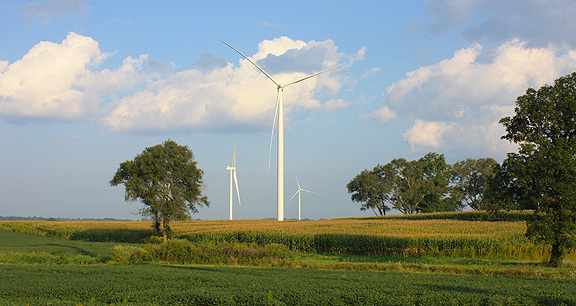 Project obstacles and solutions: The Headwaters Wind Farm contains 100 wind turbines that are expected to provide 200 megawatts of electricity for up to 55,000 homes. The project began in May 2014 and expected to be operational by the end of the year. The Headwaters project is spread out through the rural areas of Randolph County, Indiana. IMI set up one of its portable concrete plants to support the pouring of up to 900 yards of concrete per day. Each base required 430 yards of concrete and 20 yards of mud mats leading to each work site. In addition to the wind turbines, there were concrete bases poured for the poles supporting high voltage supply lines. In a project of this size and scope, keeping concrete flowing and consistent is critical. In particular, work sites could be as close as a mile or as far away as 20 miles from the concrete plant. Drivers, plant and QC/QA personnel worked together to maintain a consistent slump and air entrainment from one pour to the next.